The Gubal Barge: an unique marine biotope in the northern Red Sea. Scubadivers visiting the northern Red Sea normally go for the magnificent reefs flanking the southern Sinai peninsula in Ras Muhammed National Park. Sharkreef and Yolanda reef are its most prominent hotspots. The steep drop offs and strong currents make this the most spectacular diving site of the northern Red Sea, with packs of Bohar snappers visiting the area in the right season. The sandy plateau at 12 meters changes abruptly in a steep drop off, descending to an abyss of around 3000 m deep. Marking the place where millions of years ago the African and Asian continents drifted away from each other by powerful geological forces, leaving the Gulf of Aqaba and the Gulf of Suez as shallow clefts at the east and west side. At the eastern side of the Sinai peninsula, at the entrance of the Gulf of Aqaba, there is the Tiran Protected area with Tiran Island and Jackson reef. At the western side, at the entrance of the Gulf of Suez one finds lots of cargo ships passing to and from the Suez channel. Close to the Sinai peninsula there is Shab Ali reef with the famous Thistlegorm wreck, perhaps the most famous sanctuary for divers and UW photographers. Thistlegorm was sunk in 1941, packed with a cargo of supplies bound for the British army based in Alexandria, but bombed by German plane on her way to port. West of the entrance of the Gulf of Suez (closer to the Egyptian mainland) one finds still more popular wrecks lined up in the area of Shab Abu Nuhas, also called a ships graveyard. In respective order: the Ghiannis D., Carnatic, Chrisoula K. and Kimon M. South of Abu Nuhas lies Shadwan Island, the largest island of the northern Red Sea. All these sites have become a must for wreck lovers and are visited by numerous Egyptian live-a-boards and day boats from Hurghada as well as Sharm el Sheikh, packed with divers. Only in the very early morning, one can hope to find some tranquility. My personal favorite spot is a small -at first sight insignificant- wreck called the Barge. It is located at Bluff point at the eastern side of Gubal island in 14 meters of water and particularly popular as a place for night dives. There is not much left of the wreck itself, no superstructure, only a mass of pieces of twisted metal providing ideal shelters for literally hundreds of species of marine life. At a 5 minutes swim from the wreck there is a shallow lagoon where rare yellow gobies seek shelter in the branches of large Acropora corals. The Barge is an open hull some 35m long, now broken in several parts. It is believed to be a tugboat sunk during the Arab-Israeli war. Its corals are poor but It’s inhabited by schools of sergeant major, soldierfish, numerous gobies, triggerfish (including the Arabian Picasso triggerfish), various species of damselfish, angelfish (including the Arabian angelfish), stonefish, scorpion and crocodile fish and two giant moray eels, one of which is nicknamed George. George is normally found at the bottom of the wreck at the port side with the head sticking out of its shelter (see insert). 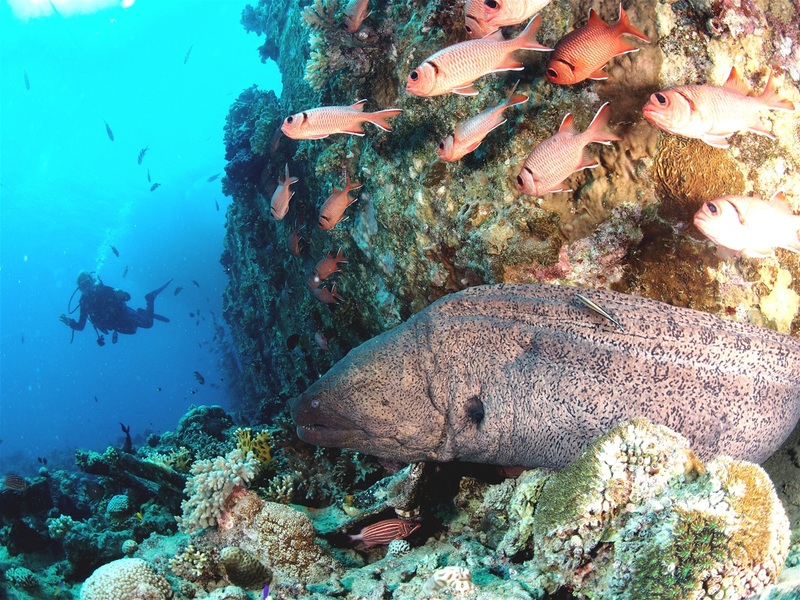 The other eel has chosen the top of the wreck, hiding in its favorite habitat under a lump of coral.